So do I ? I mean work really hard at this ? I’m not always certain I am working as hard as I should. I pray for strength, I stand as firmly as I can, but is it as firmly as I should? The book of Colossians is a wonderful letter to each of us. It is God speaking to us…here he is telling us to follow the commission. Paul speaks of working diligently at the commission, using the wisdom God has given them to teach and preach the Gospel. It is my commission, The Great Commission, to share the Word of God with everyone in our path. Either by carrying ourselves in a manner representative of Christ, or by obeying the Holy Spirit when He rises and gives us urge to pray for someone or witness to them. So I search myself, down here in the Hopeannfaith’s well. Do I work hard at this? 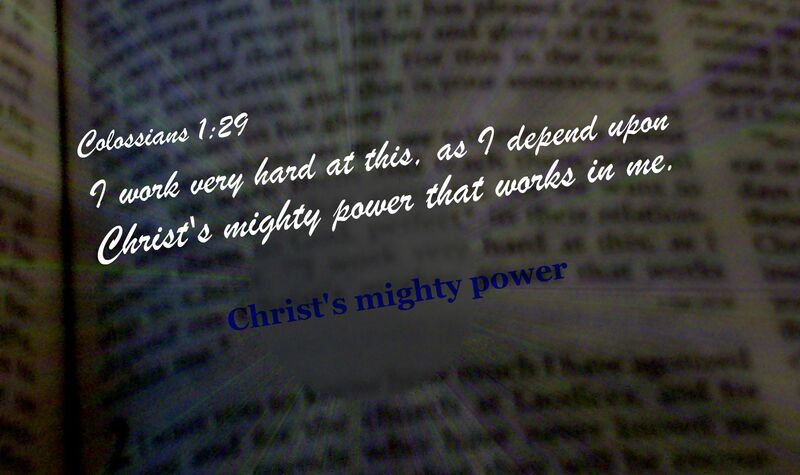 Do I depend upon Christ’s mighty power that works within me? Or do I try these things in my own power? I will sit here in the well and meditate upon this. Asking the Father to reveal in me how to tap into the Mighty Power of Christ within me. I will seek understanding or revelation…I’d like both. Categories: Guidelines for Living, My Journey, Understanding vs. Revelation | Tags: Holy Spirit | Permalink.